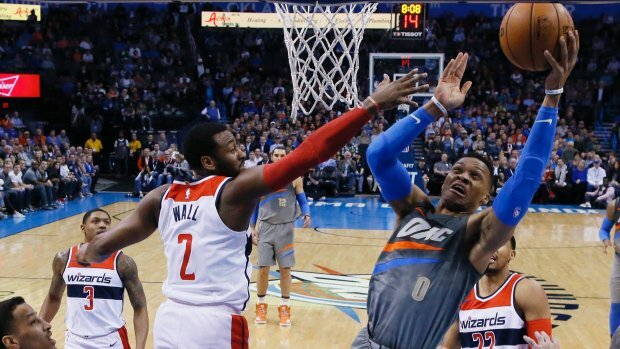 Russell Westbrook and the Oklahoma City Thunder had a tough one on their hands Thursday night with the Washington Wizards in town. The Thunder’s ‘Big Three’ had been playing well lately, but they would need to have a good night to handle John Wall and Bradley Beal. Two of the Thunder’s three ended up having off nights. But the other one— he more than made up for them. Carmelo Anthony hit just four of his 11 shots for 13 points, and Paul George made just six of his 19 shots for 18 points. But where these two lacked, Russell Westbrook more than made up for them. The reigning MVP hit 19 of 29 shots for 46 points to lead the Thunder to a 121-112 win over the visiting Wizards. ”I just read the game honestly, and if it’s time for me to take over, then that’s what I do,” Westbrook said after the game (CBS Sports). The Thunder had led by 14 at the half, but the Wizards were able to close the gap to eight heading into the fourth. With Anthony and George struggling all game, Westbrook decided to take over the game. He ended up hitting nine of 11 shots in the fourth quarter for 21 points. The Thunder got out to an earl 10-0 lead when the Wizards failed to make a basket in the first four minutes of the game. By the time the end of the first rolled around, they had trimmed the deficit to five, 25-20. A solid defensive effort combined with good offensive play allowed the Thunder to take a 54-40 lead into halftime. But the Wizards rallied in the third and managed to tie the game up at 68-68 with about four and half minutes to play. 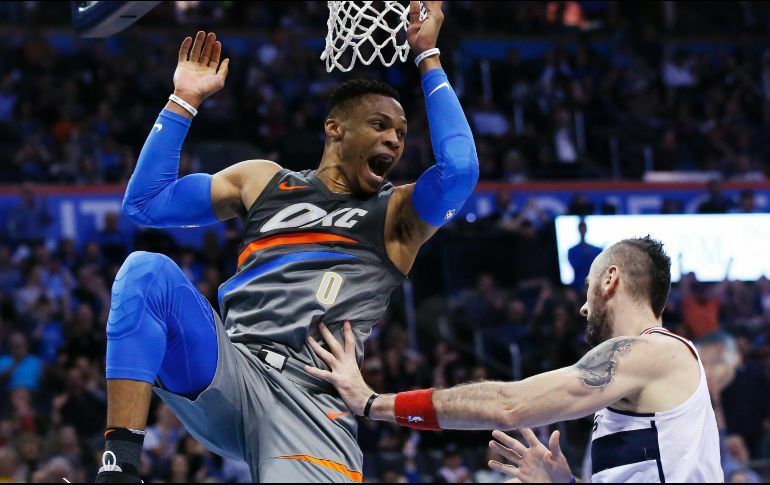 But then the Thunder closed out the quarter with a 14-6 run giving them an 82-74 advantage heading into the fourth– which is when Russell Westbrook went nuts. Bradley Beal and John Wall did their best to lead the team back into the game, but they couldn’t keep up the level of play they needed to in the fourth. The Wizards pulled to within three early in the fourth quarter but were unable to keep up the pace. Bradley Beal led the way for the Wizards with 41 points (15-26 from the floor; 6-11 from three-point range) followed by John Wall with 21. Markief Morris chipped in 20. It’s good to know that Russell Westbrook can still take over a game when the Thunder need him to. But if they are going to make any noise in the playoffs, they will need George and Anthony to bring their ‘A’ game every night. Good thing they still have plenty of time to work the kinks out before the postseason starts. The loss is the fourth in the last five games for the Wizards. If they can’t figure out how to get back on track soon, they may find themselves on the outside looking in for the playoffs. They have a much easier game on deck Saturday night against the Hawks in Atlanta. Oklahoma City will look to make it seven wins in a row when they travel to Detroit Saturday night.